The Japanese word Reiki means Universal Energy . Eastern medicine has often been based around working with this energy, which flows through all living things and is vital to well-being. Known as ki in Japan, chi in China and prana in India. Acupuncture, T'ai chi and Yoga are also based on the free-flow of this energy in a person. The energy of Reiki can be used to great effect in many ways. Whether one is suffering from stress or tension, and the many symptoms associated with this, or wishing to improve the quality of relationships at home or work, the beneficial effects of Reiki occur on many levels. Reiki can accelerate the healing of physical problems, balance the emotions, and free us from restrictive mental attitudes. A session is usually carried out with the client lying down or sitting, in a comfortable and peaceful environment. There is no need to remove any clothing. 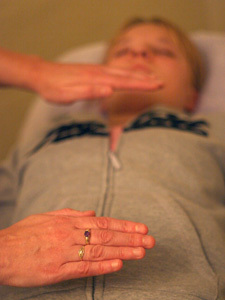 The practitioner places their hands gently, in a series of positions, on or over the body. The client's system automatically draws in only as much Reiki as is needed, using it in whatever way is most appropriate at the time. Reiki may be felt as a flow of energy, mild tingling, warmth, coolness, other sensations, or nothing at all. Reiki is deeply relaxing, eases stress, and has a calming effect. Treatment is enhanced if one can rest for a while afterwards and drink plenty of water to help the body detox. The beneficial effects of Reiki may be felt for several days. Reiki encourages and supports positive personal change such as improving the diet, having more rest, exercise or leisure time, and may reduce the need for alcohol and tobacco. Reiki can allow us to respond more calmly to all events, and build on a more resourceful state of being. Reiki is a gentle energy and may be used safely by all ages, including the newborn, pregnant mothers, surgical patients, the frail and the elderly, regardless of their state of health. Reiki can enhance everyday life, and regular sessions help to ward-off illness and fatigue. Reiki practitioners: Nicholas Lintott (Reiki Master).